Another new trademark scam! This one is a change of name, from ITP and/or ITR to WTP. 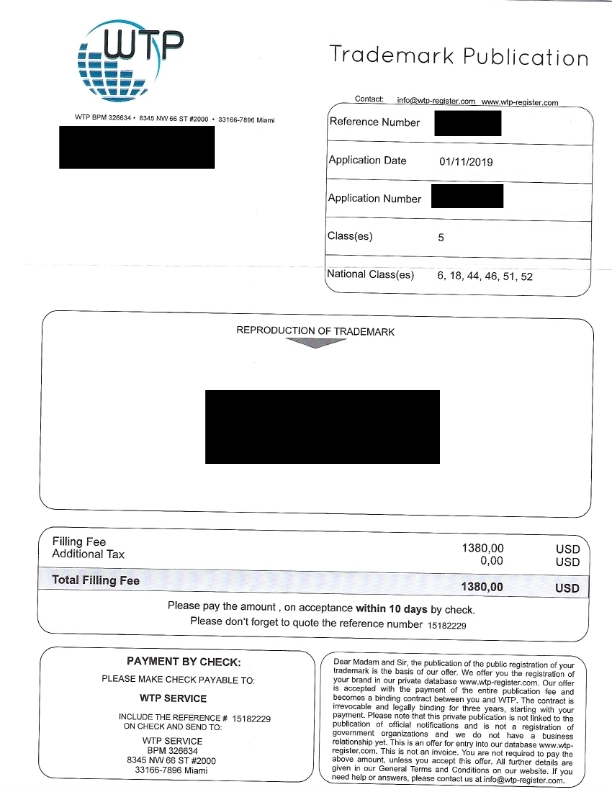 See image below for their “offer” sent to many trademark application or registration owners. The offer, for $1348, is for inclusion in a publication. A publication with essentially no real value. I have never heard any trademark professional recommend inclusion in such a publication; nor any trademark professional use such a publication for any research. They are incomplete and unofficial. They do not add to your trademark’s protection in any meaningful way. If you have been taken by this scam, I suggest that you file a complaint with the FTC, write a letter to the USPTO Commissioner, and contact law enforcement. Beware of such scams. Read the fine print. Contact your attorney. Report scams to the FTC and USPTO. Thank You they sent me a letter and because of the 1,380.00 cost I researched it online and found your site. Thank You!!!! Our accounting department nearly fell for the same, since they sent it to at the same time as our other trademark renewal bills came due. I can only imagine how many companies have fallen for this, as the “small print” is still misleading even for many who take time to read it. Just received one in the mail today. Is there any way to report these people? This is so fraudulent and misleading. We need a ceast and desist! I received the same notice and at first thought why is it so expensive. I thought I paid everything due with the application. Then I read the small print at the bottom. The fee is just to be listed in their database????? I am sure many people believe it is a bill and pay it. This scam needs to be stopped. I’ll be writing the Florida AG. Just got mine, this is a crazy world.